There is no singletrack left in the system. They widened the corridors and added more lanes… See San Tan Park Blog Entries for stories from my exploration days in the San Tans. San Tan Park is located in the south east valley. The park has a fairly new trail system. Maricopa trial crews spent last winter out there building new beginner friendly double wide trails. The San Tans trails have been know in the past as sandy and wide with very little singletrack. That is all true. Even though the trails are all very tame, not technical or steep, they are far from boring. Singlespeeders and hardtail riders might enjoy the moderate trails while speed junkies can test their skills flying through pristine Sonoran desert. Sorry downhillers, there’s nothing for you except for a 1/4 mile drop in from the Goldmine Saddle into the Park…the Rite of Passage. It’s sweet DH but too short to bother. The views of Rock Peak and the Malpais Hills are the best reason to get out there. Goldmine off of Skyline Rd: $2 ride-in fee. There’s a brand new lot with plenty of space for cars, trucks, and trailers. Phillips Main Park Entrance: $6 drive-in, $2 ride-in fee. No Parking signs posted from park out Â¼ mile along the road outside the park. The main entrance has a visitor’s center and facilities. San Tan Park is also home to the Nathan Martens Arizona Memorial honoring fallen soldiers who served in Iraq and Afghanistan. Goldmine: Rite of Passage: The Goldmine trail from the Goldmine TH over Goldmine mountain is a â€œrite of passageâ€ into the park. Only truly adventurous climbers enter from here. Itâ€™s a 1.1 mile climb. See First Ride in San Tan Park for details of this climb. 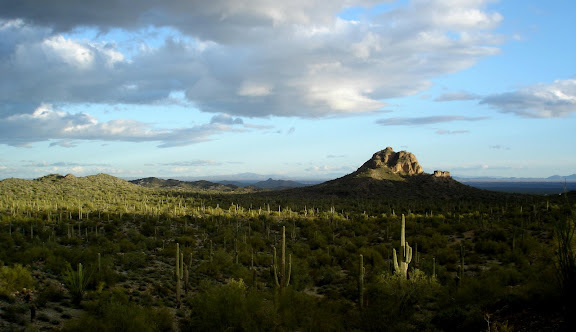 San Tan Trail: The San Tan trail has six distinct legs. It is one trail with many personalities. San Tan North: After the drop in to the park out of the rite of passage, San Tan meets with Goldmine then follows a wide jeep road until it meets with Moonlight. Itâ€™s fun, itâ€™s fast and itâ€™s wide. San Tan West Singletrack doubletrack: From the Moonlight junction San Tan turns into wide singletrack doubletrack as it makes its way around a mountain. This is a fun lame trail. Small No ups and downs even a few no switchbacks. San Tan West Doubletrack: This segment drops south at the Hedgehog junction and quickly turns into doubletrack until it meets up with the Malpais Wash junction. San Tan South Singletrack Doubletrack: Awesome rolling singletrack doubletrack that runs East-West until it drops into Rock Peak Wash.
San Tan East Singletrack Doubletrack: A singletrack doubletrack climb to the saddle. Still loose in spots, needs rain and riding, but still very fun. San Tan East Wash/Doubletrack: North of Saddle the San Tan is a sandy wash with tiny stretches of rideable trail until it meets with Hedgehog. From the Hedgehog junction itâ€™s fast doubletrack back to the main park entrance. Moonlight: This is very nice doubletrack that climbs gently for just over a mile to the San Tan West singletrack doubletrack. Hedgehog: Great mile of singletrack doubletrack trail that connects off the San Tan West trail. Malpais: Scenic yet sandy. A nice trail if it werenâ€™t for about 2 miles of sand in various stretches. This trail has potential if some MTB friendly re-routing were to take place. If youâ€™re up for adventure at least ride out to the junction at the Malpais wash just passed the saddle. There is was some nice singletrack buried in there, but it is was short lived. Rock Peak Wash: All sand. MTB re-route desperately needed. CCW. Moonlight-San Tan Loop-Hedgehog. Then CW: Hedgehog-San Tan-Moonlight. CCW: Moonlight-San Tan-Hedgehog. Then CW: San Tan Loop-Moonlight. San Tan Park, Phoenix AZ from Reagan Matisse on Vimeo. Located on the very south east corner of maricopa county – a jewel of a cross-country trail system. I moved my family out to QC about a year and a half ago and prior to that had never ridden any of the SanTan trails. SoMo had always been my favorite place to ride because of location and variety of trails. I The majority of riding I do is XC similar to Desert Classic. I had made a couple attempts over the past few years to get my wife interested in mountain biking, but she was never able to feel comfortable and confident tagging along at SoMo. She gave it another shot on the SanTan trails and now she loves it! I agree the trails are not technical or intense, but we have a lot of fun and challenge ourselves. She found the confidence to look up from the trail and enjoy the view. I started her out riding Moonlight back and forth, then she gave SanTan around to Moonlight (6.2 mi) a try. Had to walk down a steep section after the bench a few times, but eventually got it. Then took her to Hedgehog and Stargazer. After about 4 months started doing SanTan to Goldmine loop. Recently she wanted to ride Dynamite and it took a few rides but she likes the challenge. I took her back to ride DC at SoMo and she actually enjoyed it! It does get sandy in the washes toward the end of summer, but packs up nicely by November. For somebody who wants to introduce a new rider to mountain biking, SanTan is great. My wife has brought a couple of her friends into the sport because of the SanTan Mountains. If you enjoy riding XC/Trail, its a great trail system. The people are very friendly and courteous. I would suggest riding a wider tire (2.30+) during the late summer months to help get through the washes. Tires like Maxxis Ikon, Maxxis Ardent, and Vittoria Goma do fantastic on almost every trail in the Valley and are great at SanTan. Most of the “complaining” is from those who have been riding the trails for years and remember when they were better and more interesting. I still ride San Tan all the time because it’s close and since the addition of Dynamite it at least has some really nice climbing. The steep part behind the san tan saddle is a lot of fun as is the swoop east-west. Hedgehog is still tons of fun and San Tan between gold mine and dynamite is fun to bomb down. We do miss the old days with narrow, more challenging trails, though. I am a hiker now at age 80, no more biking, but I did tour-bike the Netherlands in 1980’s 7 days circumavigation. Their bike trails are 6 feet wide usually and covered with crushed sea shells for great drainage (daily rain on and off it seemed to me). Luckily many coffee shops along the way, and lots of places to pitch our tiny tent each night. San Tan North Entrance is great hike up the “gnarly” goldmine trail to the saddle, then down and around all right turns to Dynamite which DOES have some uphill switchbacks in this direction where some bikers walked at times. Many bikers of all kinds, and all were kind to old hikers. The views from the Dynamite heading back to North trailhead were great. Last year we did the Southern trails, and yes, Malpais had great views and signage was better than previous years. No horses seen on any of these as we old timers hike mid-week while you youngsters work to help pay for our SS and Medicare, and we thank you. We also thank the early pioneer trailbusters AND the Maricopa Parks and Recreation which helps Pinal County maintain this park. No complaints. I agree with Jim Quinn. The trails are completely enjoyable. The only reason to criticize them is to make yourself appear to be some awesome rider who isn’t challenged by anything that any trail has to offer. I gotta say I was a bit surprised reading some of these reviews. I hadn’t been out to San Tan in several months but decided to take a buddy down there yesterday afternoon and we had a great time riding. We parked at the Wagon Wheel lot and road up Dynamite before catching up with the San Tan trail. I’m not gonna act like this is the best riding around , it certainly isn’t technical , but in my opinion it is definitely enjoyable. I have been riding Usery quite a bit simply because its close to my house and San Tan is a lot more fun and certainly offers a lot more trail options. I also ride Hawes a lot as well as Gold Canyon and I enjoy both of them , just nice to mix in San Tan occasionally. Just don’t want people to get to discouraged reading some of the other reviews. Brian is right though, on the weekends there can be a lot of folks out on horses as well as just hikers. I just try and be polite and share the trail. I’ve been mt biking for years mostly south mt and I moved out to san tan valley and this park is 10 min from my house. I have to say despite the lack of trails this park has come along way. This is an endurance trail system and if your into tech trails then go somewhere else. Of your into going really really fast then this is a great place to ride. I was really empresses with the dynamite trail it’s a challenge to climb and a blast to ride down. Also the new bike friendly addition of south San tan is a very fun addition. They seem to make improvements every year and I love that. My only complaint is all the horses on the weekends. Everyone needs to back off the sand they have been working on it and it’s much better. I rode haws the other day and it had a ton of sandy spots too. Rode San Tans for the first time today. Parked at the Goldmine Trailhead and then made my way in to the Dynamite trail. Took that around to San Tan, then right on Goldmine and then to the visitor center. Grabbed a map and took the Moonlight trail to San Tan again. It intersected with Dynamite to the left, or the gnarly looking Goldmine trail that goes up and over the mountain. Decided to give that a try, but ended up having to HAB up a bunch of it because it alternated sand and rocks and very steep. Couldn’t seem to keep my momentum. Reached the top, enjoyed the scenery then attempted the ride down the north side. More rocky than the south side and very loose, and LOTS of hikers, so ended up walking down a lot of that too, as I didn’t want to slide out of control into the hikers. So all in all, super mellow, beautiful ride, with a little gnarly HAB in there for good measure. Just road the Goldmine and another trail this AM. Can’t remember the other trail name. There was LOTS and I mean LOTS of sand. A few places the trail just went down a wash with at least 6 inches or more of loose stuff. It was a nice ride, but I don’t think I’ll be doing it again. Not worth it. Senior citizens… Ha! So true. I spent a year out there exploring primitive singletrack before they paved it all. This is the most sanitized trail system I’ve ever seen. It’s not uncommon to run into a group of local senior citizens on a guided hiking adventure. It’s as smooth as a running track around a football field. I was riding it purely for fitness only because it was technically closer to my house than any other trail system. But it takes me just as much time to drive to the West entrance to the Desert Classic, Usery Mountain Park or Hawes Trail Loops then it does to drive there because all the roads to the park are 40 mph zones. Completely agree with the review above. Not only have they widened all the trails behind the peak, but they re-routed the trails away from the most interesting and challenging parts. Who decided on this crap?